entrepreneurs and other actors of the international space community. 15:15 – 16:00: Heads of Agencies Press Conference Media representatives will get the opportunity to address questions directly to the Heads of Space Agencies. Location: CCB Gallery After the press conference the Heads of Agencies will interact with students at the ESA booth in the Exhibition Hall. the end of 2019 and for which a preparatory Council meeting will be organised as an Intermediary Meeting of Ministers (IMM2018) on 25 October 2018 in Madrid, Spain. Public Day event at IAC: "Space is Big - Space is Public"
will report on their experiences in space and answer questions from the audience. on 3 October. Alexander Gerst will connect live from space to the audience at IAC and answer questions about his work and life on the International Space Station. 2018, the International Astronautical Federation (IAF), as well as the Center of Applied Space Technology and Microgravity (ZARM) at the University of Bremen. expects more than 4000 attendees. 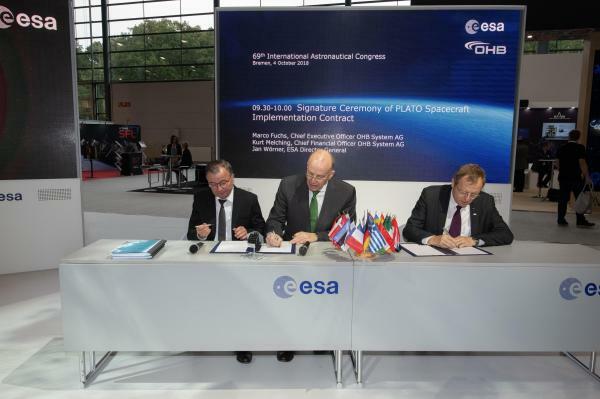 The German Aerospace Center (Deutsches Zentrum fuer Luft- und Raumfahrt; DLR) will use the congress to showcase a selection of its current aerospace projects in an area measuring 560 square metres. from government, science and the business community to share their thoughts at the German Night on Tuesday, 2 October. The aim is to further strengthen national, European and global networks within the field of aerospace research. in Bremen as an opportunity to present a digital elevation model of the Earth based on radar data for use within the scientific community." separate from its mothercraft during the congress week – on Wednesday, 3 October 2018 – and will land on the asteroid’s surface. The scientists from DLR, JAXA and CNES expect initial data and findings just one week later. Pelzer, DLR Executive Board Member for the Space Administration and thus responsible for the German contributions to the horizons mission and to ESA. Airbus stand. Alexander Gerst is scheduled to work with CIMON for the first time on the ISS in November. precise measurements of the Earth’s gravitational field. of how aerospace already influences our lives today. within the agricultural sector. The exceptionally hot summer of 2018 recently indicated the importance of research into global climate change. by using cooperative swarms of autonomous robots. 'Involving Everyone'. Admission to Public Day is free. first IAC for students 'Teen Spirit for Space' event jointly with the Center of Applied Space Technology and Microgravity (ZARM). The 35 participants from Years 1 to 11 come from all over Germany. will provide tomorrow’s scientists with fascinating insights into the current research projects. Tour participants will take a look behind the scenes of DLR Bremen and demonstrate their skills during a system analysis. in collaboration with external partners. It has already attracted more than 50,000 visitors since it opened on 10 July 2018. After hosting the IAC in 2003, Bremen is once again a suitable venue chosen by the organiser IAF, which is staging the conference for the 69th time. The Hanseatic city is, after all, one of the main hubs of aerospace in Germany and Europe. DLR operates its Institute of Space Systems in Bremen, and many industrial partners are also domiciled in the city. part of the labour market. of the Federal Republic of Germany, who will act as the local and national hosts. On Tuesday, 2 October, the parliamentarians will have the opportunity to visit the local aerospace industry and the DLR site in Bremen. 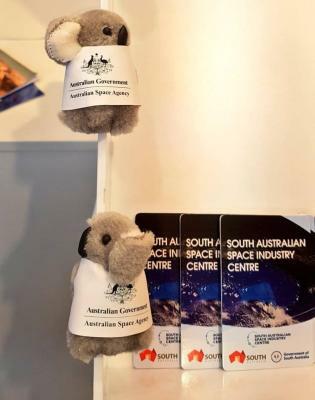 After many months of planning, The Australian Space has come to life at IAC 2018 in Bremen. The booth represents a sample of what Australia has to offer, bringing our national space sector activities together for the first time, for thousands of supporters from space agencies, industry and academia from across the globe. 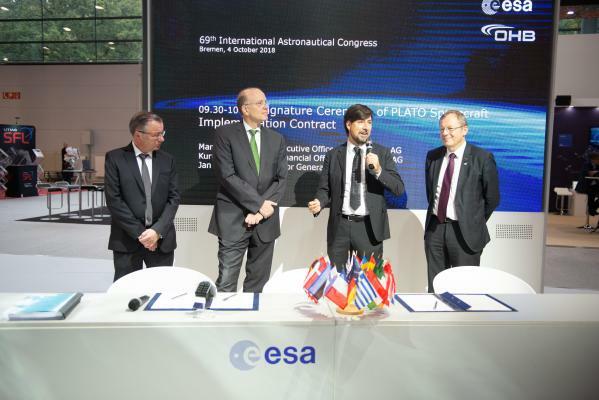 Signature Ceremony of PLATO Spacecraft Implementation Contract. L to R: Kurt Melching, Chief Financial Officer OHB System AG, Marco Fuchs, Chief Executive Officer OHB System AG, Filippo Marliani, Project Manager, Jan Wörner, ESA Director General. 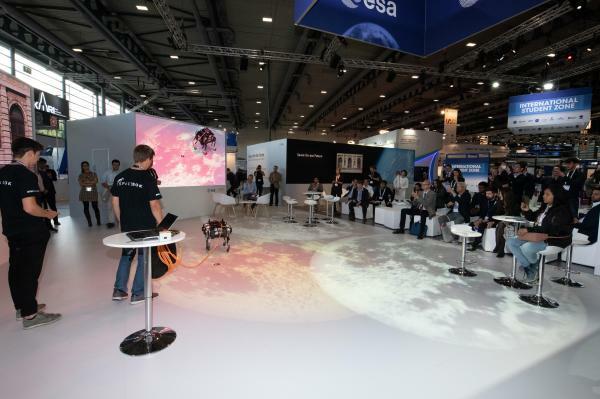 Students from ETH Zurich and ZHAW Winterthur demonstrate their Spacebok jumping robot at IAC 2018.